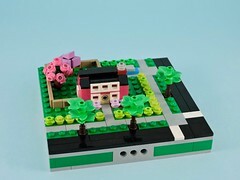 I happen to think that the travis brick (the 1×1 brick with studs on all four sides) is the greatest thing that ever happened for micro builders. So many tiny snot structures wouldn’t be possible without all those studs in nearly every direction. 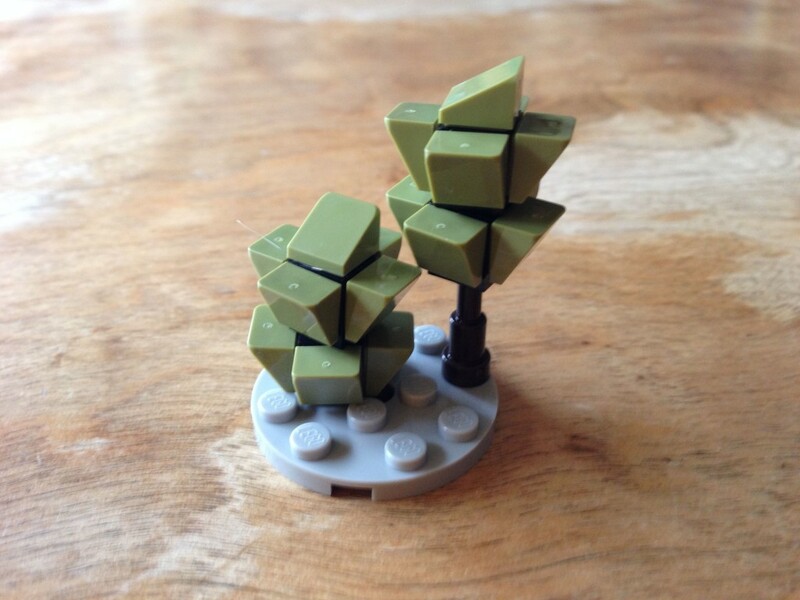 With the addition of cheeses and telescopes, it is criminally easy to build beautiful little trees. This first tree reminds me of modestly sized evergreens. They assemble simply. Cover all of the side studs of a pair of travis bricks with cheese slopes, orient them so that they slope downward, away from the top stud. Top one of the travis bricks with another cheese slope and then stack it on the second. I like to use telescopes as trunks, lifting the greenery off the ground. They can also look good without the telescope, as a younger tree. 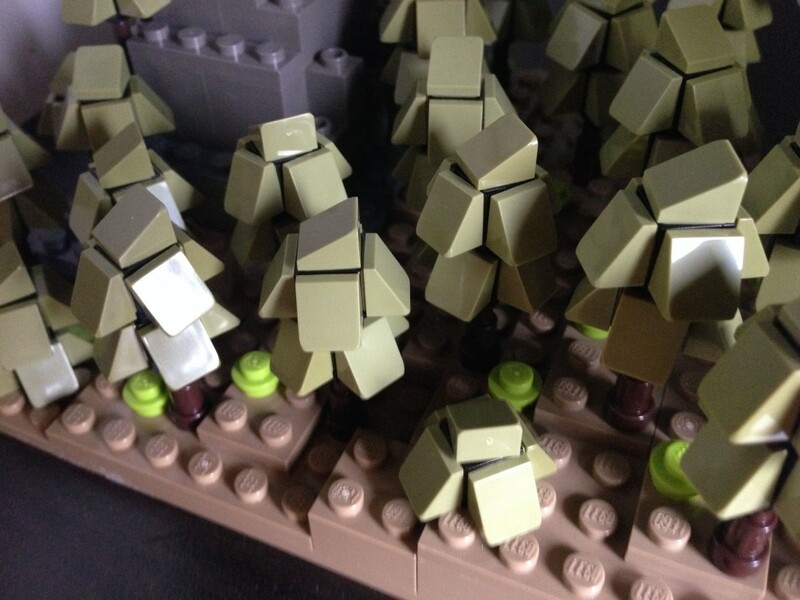 I’ve made my trees here with olive slopes, black travis bricks, and dark brown telescopes. 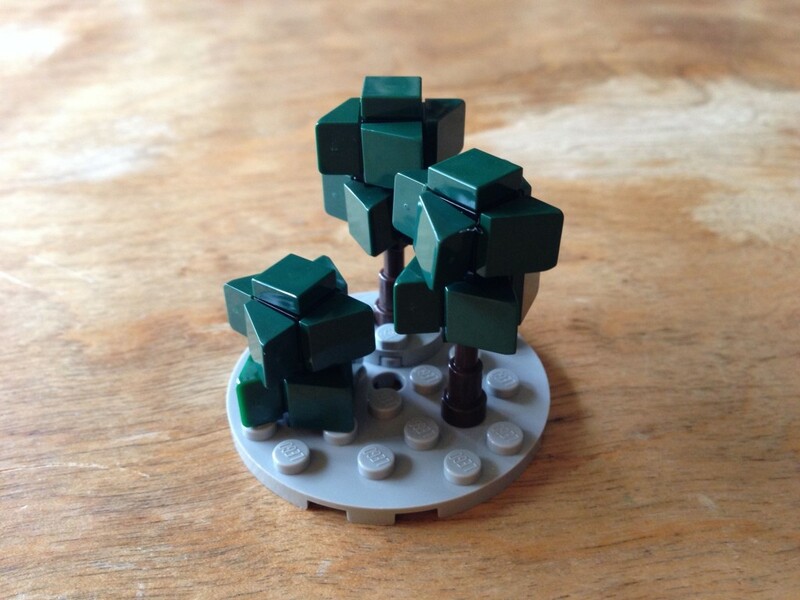 Each tree consists of 12 elements, but since the olive cheeses and travis bricks have been in the Pick-a-Brick wall at my local Lego store, I have enough supply to build small forests on the cheap. The key to keeping them realistic is to assembly the trees with a tad of sloppiness, allowing the cheeses to be slightly off of square and to vary the alignment of the stacked travis bricks. It is also a good idea to vary the elevation of the ground. Even though you are going to cover it with trees, this gives the trees varying height too. This all adds to the organic look that helps the viewer forget they are looking at bricks. Different colors can entirely change the character of the tree. I’m not a big fan of the dark red cheeses, since these trees look more like evergreens to me, but the white makes a beautiful snow-covered tree. I suspect that these trees would look too busy if I mixed the colors on a single tree, but it would be worth experimenting with color variation across a larger expanse of trees. Here, I’ve transformed my little trees into giants. I’ve switched to using reddish-brown rounds bricks for the trunks and interspersed them with slope-covered travis bricks. This gives a much greater control over the height of the trees, while still using common elements. The thick reddish trunks remind me of the redwoods that I grew up with. For this tree, I’ve changed the slope orientation and created a completely different looking tree. I switched colors to match the tiles that I’ve used to top the stack of travis bricks (I don’t have any of them in olive). These look so different, evoking upward sweeping branches. 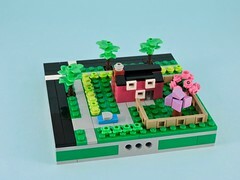 I suspect that one could make interesting cherry blossom trees with pink cheeses and this style. 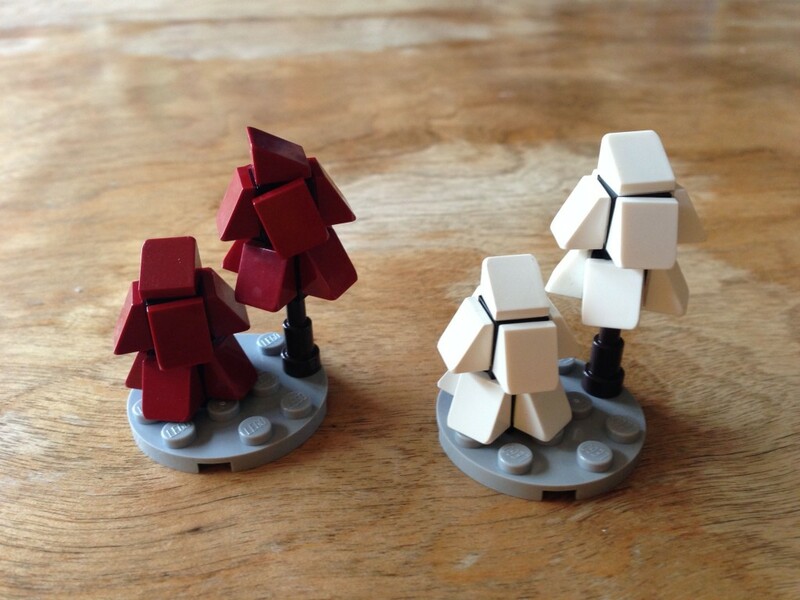 I can’t say that I like these trees as much with cheeses on top, but they can still look good if you don’t have a supply of small tiles. This last variety reorients the cheeses to form what looks like a pin wheel (when viewed from above). Again, I’ve topped them with tiles to give a softer look. I kind of like these spiky little guys. 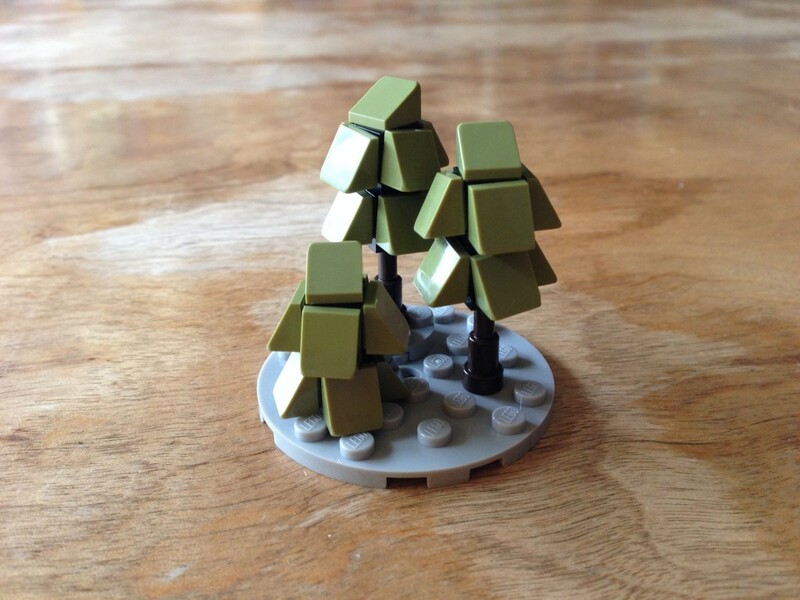 Small trees like this shift character completely when you change a color or element. I happen to really like this tree in lime, it has a wonderful air of Spring. 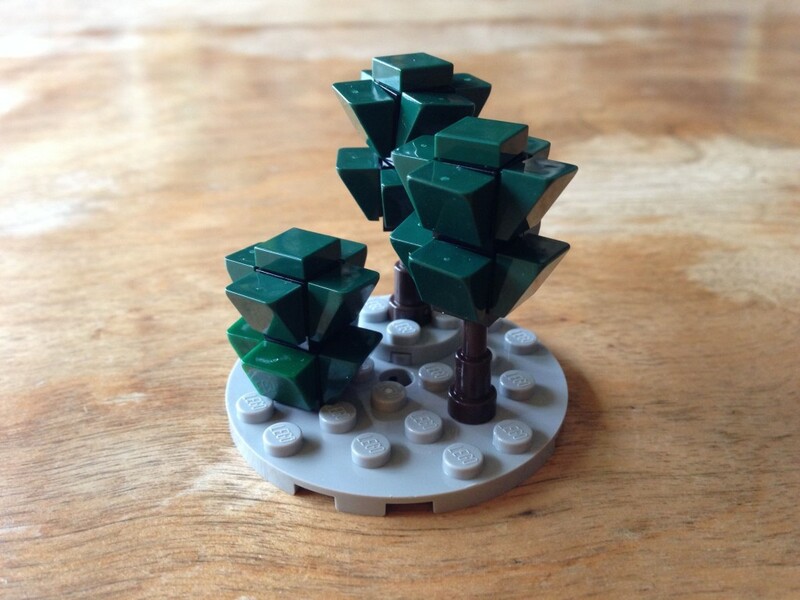 Hopefully all these happy little trees have you itching to build some of your own. 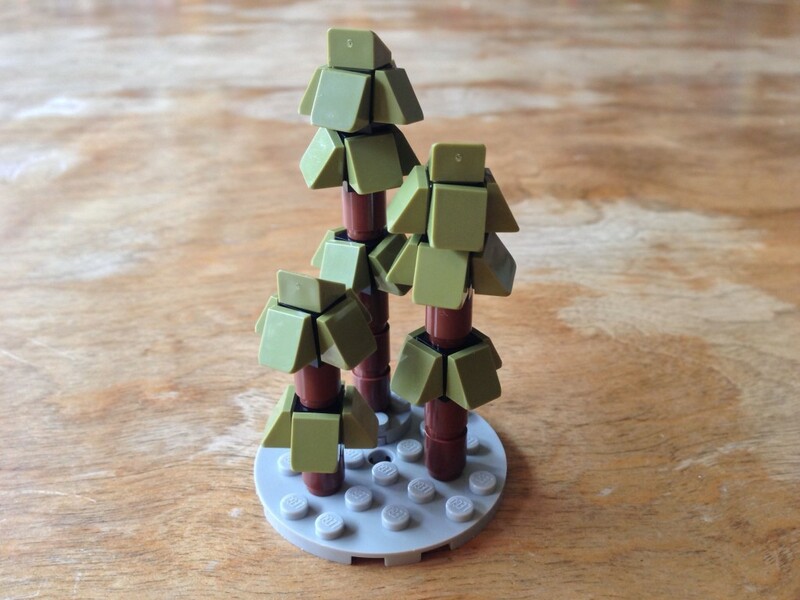 Experiment while you build and find the combination of colors and geometry that bring your trees to life and complement the rest of the build. If you want to build the dark red as deciduous, alternate the slope on the courses. That is, the lowest travis brick should have the cheese with the slope facing down while the upper travis brick has the slope facing up, ala the original tree. Top as normal. This should give a little bit of a globular appearance. 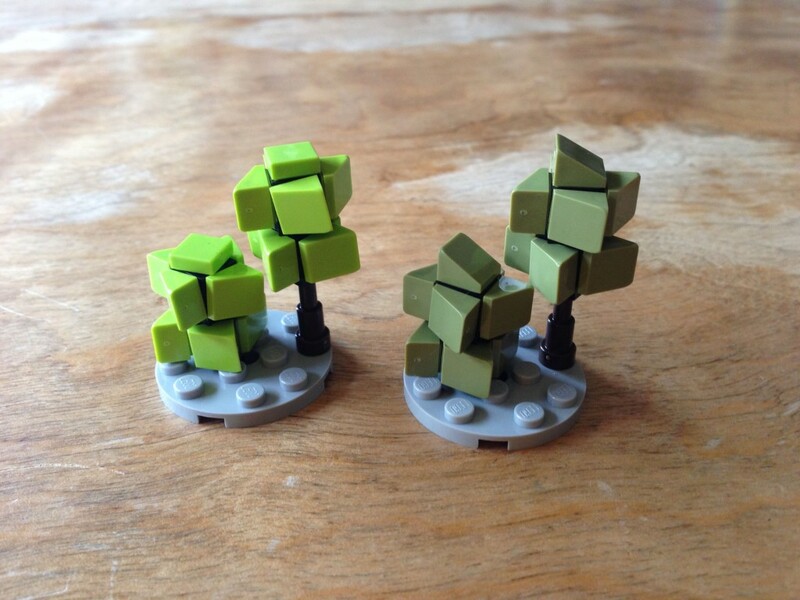 I totally forgot to talk about making trees like that! I’ll mention them in a couple weeks when I revisit making trees with cheese slopes. Thanks!